EU Member States have employed in recent years a number of policy levers on education and training, which affect, in different ways, the effectiveness of skill formation and matching in EU countries. These policy levers aim to influence the extent to which the qualifications, knowledge, skills and competences acquired by learners and workers strengthen their employability, ability to find sustainable employment and, ultimately, their productivity and innovation. Within the strategic framework for European cooperation in education and training (ET 2020) , as well as the revised priorities for European cooperation in VET , a number of key policy priorities and instruments have been set up by national and EU policy-makers. Some of these refer to the need to promote work-based learning in all its forms, improve the quality of education and training systems, offer efficient and integrated guidance services and make validation of non-formal and informal learning feasible. Other policy initiatives are also high up in the policy agenda, such as continued efforts to improve the transparency and comparability of qualifications across Europe via the development of National qualification frameworks (NQFs), which link to the European qualification framework (EQF). The New skills agenda for Europe proposed by the European Commission will soon suggest policy actions and initiatives that will seek to strengthen these European tools . EU adult workers were asked as part of the ESJ survey to identify the importance of several factors that influenced their decision to accept their current job (Figure 1). The survey reveals that the most important motivators driving individual’s job choice include the intrinsic satisfaction offered by the nature of the work, the provision of job security and the work-life balance. The overall match of individuals’ qualifications and skills with those needed by their job, both at the time of recruitment and over time as their career progresses, ranked much lower in significance. It may be reasonable, especially during the recent years of economic downturn, for individuals to place a higher premium on the security of employment. However, the lower weight put on the match of their skills with their job requirements is concerning, as it may be associated with adverse long-term consequences, such as enhanced risk of unemployment and career instability. NB: Percentage of respondents who ranked each factor with a score higher than 8 on a 0-10 importance scale, where 0 corresponds to ‘Not at all important’, 5 ‘Moderately important’ and 10 ‘Essential’. The ESJ survey data confirm that labour market and geographical mobility in Europe is still very limited (Figure 2). Around one in five (17%) respondents indicated that they had to move home when they started their job with their current employer; 9% moved to a different region but within their own country, 6% moved but within the same region and only 2% moved to a different EU country. Perhaps most crucially, the ESJ survey data highlight that those groups most in need of job mobility are exactly those least likely to engage in mobility. It is, on average, younger, high-educated, male professionals who are more likely to have moved to a different country or region prior to commencing their current job, motivated by the need to advance their career prospects. By contrast, geographic mobility is less common among females, older and lower-educated individuals and those who experienced a prior spell of unemployment or inactivity before finding their work. 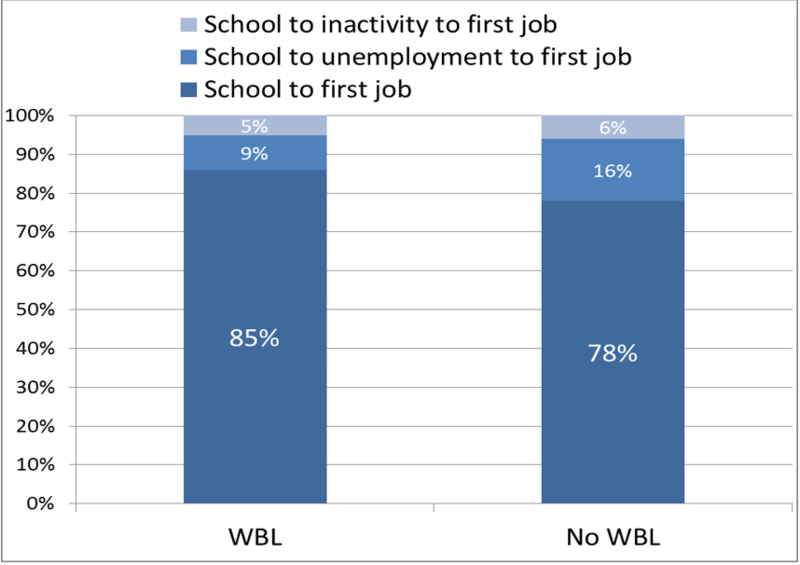 The ESJ survey data confirm that the experience of workplace learning is positively associated with a faster transition to a first job (Figure 3). NB: work-based learning corresponds to workers who responded that ‘during their studies, they experienced some learning in a workplace (e.g. through apprenticeships, internships or other forms of work-based learning)’. Sample refers only to those whose current job is their first job and is broken down by labour market status prior to finding the first job. Among those who experienced some learning in a workplace during their studies, 82% went directly to their first employment after completing their education and training, while only 9% entered unemployment as an interim stage prior to finding their first job. By comparison, 15% of graduates who did not spend any time at all in a workplace as part of their studies went straight to the unemployment registers and only 77% made a direct transition to a job. Despite fostering a tighter link between education and employment, the data reveals that there are stark differences in the availability of workplace learning between EU countries, while workplace learning is still very much tightly knit to traditional manufacturing and health-related economic sectors. While over 60% of EU tertiary education graduates with a medicine and health-related degrees had some workplace experience whilst studying, only about 30% of STEM graduates and less than 2 in 10 graduates from humanities, languages and arts degrees did so. In addition to a lack of basic or relevant skills among specific subgroups (e.g. unemployed; first time job entrants), as well as skill gaps in dynamic sectors and occupations (e.g. ICT), the ESJ survey has shown that in many cases individuals possess skills, but these are not identified, exploited or properly rewarded. In particular, the survey has revealed how skills acquired on the job or through other relevant experiences are not necessarily recorded in a qualification or documented. For instance, Figure 4 shows that although 1 in 5 older aged EU employees have a lower qualification than needed by their jobs (underqualified), a very small share thinks that they do not possess the necessary skills to do their jobs (underskilled). Overall, only 1 in 10 EU workers with a lower qualification than needed said they have insufficient skills relative to the level needed to perform their job tasks. Of those adult workers who entered into their current job underqualified and underskilled, 86% have developed enough or more skills than required over time, as a result of their continuing non-formal and informal learning . While overall in the EU28 sample, about 4 in 10 (39%) adult employees consider that their skills exceed what is needed to do their job. What the above empirical facts highlight is that EU education, training and employment policies still have significant scope to foster greater mobility of population groups in need, most notably by facilitating improved recognition of qualifications and skills at EU level and by offering reliable and timely skills intelligence, which will strengthen the value of career guidance and counselling. To achieve Europe’s medium-term goals on VET and employment, much also still needs to be done to extend workplace learning opportunities to a wider segment of the EU’s graduate population. Finally, it is evident that the potential for validation of the non-formal and informal learning of Europe’s skilled workforce is yet to be fully grasped, so European skills policies, also stimulated by the European Commission’s new skills agenda, need to place greater attention on making the most of Europe’s existing, yet hidden, stock of skills. Discover more ESJ survey indicators and analysis at the Skills Panorama! Please cite this short analytical piece as: Cedefop (2016), ‘Policy tools for a New Skills Agenda: What are the key challenges?’, #ESJsurvey Insights, No 5, Thessaloniki: Greece.